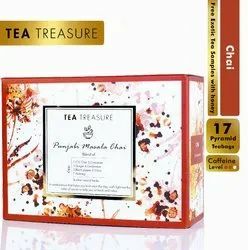 Prominent & Leading Manufacturer from New Delhi, we offer tea treasure pure chamomile, tea treasure pure rooibos, tea treasure super green, tea treasure peace, tea treasure super tulsi and tea treasure super mint. 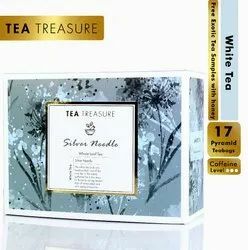 Come on the way of relaxation with pure chamomile tea. 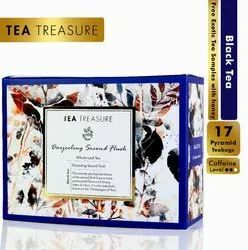 You will surely cherish the taste of this absolute beauty as it has a cool feel with it that recharges your muscles and pumps them with energy. The quest for the best is our motto . The best leaves are selected and collected from Africa to give our consumers a memory of rooibos tea that they can cherish. NO flavours added. "Princess of Green Tea is a carefully selected green tea leaves, gently steamed and rolled for a fresh delicate taste. NO flavours added." Jasmine in itself is known for its powerful aroma. 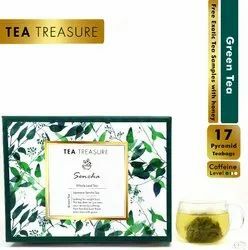 It is blended with the green tea to provide mesmerizing flavour and powerful taste. It will make your smile even more beautiful. Jasmine buds are kept with tea leaves for a certain time and then the processing happens. This is done to give a natural flavour to the tea. 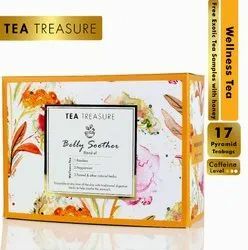 This seals the health benefits completely and provides aromatic cups. No flavours added. 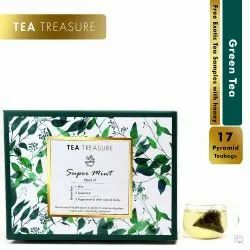 "This tulsi green tea is blended with a quality whole leaf green tea and 5 types of tulsi like Shyam Tulsi, Ram Tulsi, Shwet Sursa, Van Tulsi and Nimbu Tulsi. 5 types of tulsi like Shyam Tulsi, Ram Tulsi, Shwet, Sursa, Van Tulsi. No flavours added." 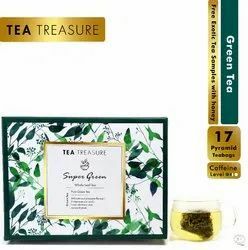 "Blended with the most quality green tea and herbs, the components are sourced from reputable gardens. NO flavours added." 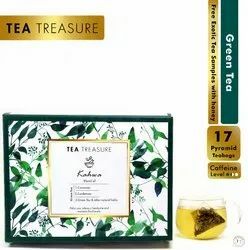 This tea energizes and has a warming effect and it's particularly beneficial to drink Kahwa on cold winter nights.It helps in relieving headaches and maintains fluid levels in the body. 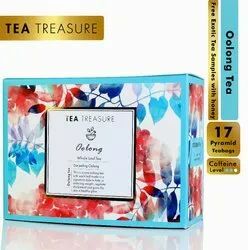 This Tea is a lighter take on a traditional tea. 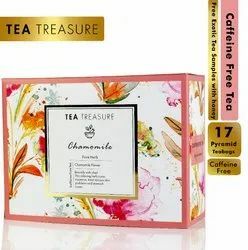 Our version adds cinnamon, cardamom, and pretty saffron strands to the mix, for a light and delicate tea you can sip on all day long. For an authentic touch, try brewing it with sugar or honey. 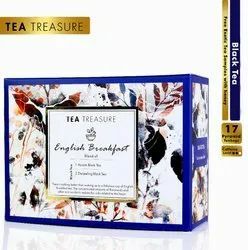 The tea steeps up a bright golden colour, with a surprisingly smooth texture, with soft muscatel notes. With its clean flavours, it is, without a doubt, the very best of Darjeeling tea.
" TeaTreasure Darjeeling Second Flush - Anti-oxidant rich black tea - 1 Teabox ( 18 Pyramid Tea Bags ) "
This delicious and satisfying tea is purposefully formulated to meltdown saturated fat naturally with Seabuckthorn, Licorice, Ginger, Cinnamon, Ginseng, Terminalia-chebula and Terminalia-Arjuna. Additionally Moringa contains proteins, vitamins, and minerals to keep your metabolism higher and maintain energy you need to keep up an active lifestyle. 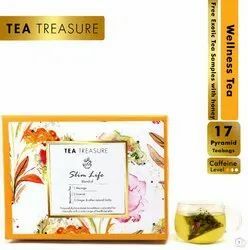 "Thoughtfully blended with flavourful high-quality Chinese Mao-Feng green tea and herbs.Enjoy an indulgent and satisfying cup of Slim Lift tea as a delicious addition to a weight loss program of exercise and a balanced diet! NO flavours added." Leaves of sencha are hand-picked and hand-rolled. One can see the leaves unfurl in hot water.The quality that leaves impression is awaiting. So come and grab your pack of sencha now. NO flavours added. "This blend is sure to become an all-season favourite as well as when your immune system needs support. Echinacea encourages the immune system and reduces many of the symptoms of colds, flu and some other illnesses, infections and conditions." "Traditionally used for centuries, our exclusive blend combines three parts of Echinacea - the leaf, aerial parts and root, an herb that is believed by herbalists to support the immune system. We complement this blend with Terminalia-chebula, Tulsi with the hints of spices combine with lively Lemongrass and sweet Licorice, Ginger for an intriguingly delicious blend. NO flavours added." 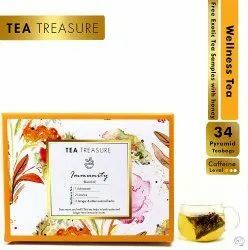 "Tea Treasure recognize the wisdom of ancient herbs and use only the finest chamomile, lavender, lemongrass, gotukola in our tea. 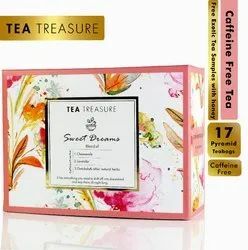 Enjoy a warm soothing cup before bed...Sweet dreams. NO flavours added." The tea has a soothing and mildly sedative effect which relaxes you. This blend is anti-inflammatory, boosts immunity and it's completely caffeine-free. For total relaxation why not try a cup of our Herbal Tisane while reading your favourite book. This tea will help soothe you after or even during a hectic day.
" 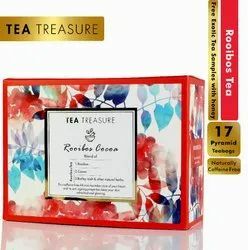 TeaTreasure Rooibos Cocoa Red Tea - Caffeine Free Antioxidants Rich South African Tea - 1 Teabox ( 18 Pyramid Tea Bags ) "
The Red Tea that helps with digestion. It is high in minerals , calms your nerves and is rich in iron, calcium and potassium. Cocoa is full of antioxidants and is anti-inflammatory in nature. Relax your muscles and destress yourself with this rejuvenating drink. A sip with that awesome slurp will travel directly to your heart, making it your perfect partner for the day. 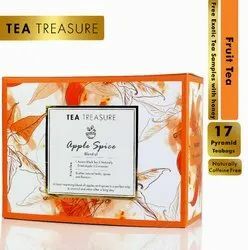 Finish off a meal with this tea and skip dessert altogether.